Bispecific Antibodies (BsAbs) are antibodies that can simultaneously bind two separate and unique antigens (or different epitopes of the same antigen). The primary application of BsAbs have been to redirect cytotoxic immune effector cells for enhanced killing of tumor cells by antibody-dependent cell-mediated cytotoxicity (ADCC) and other cytotoxic mechanisms mediated by the effector cells. See schematic below for concept. Figure 1: Bispecific antibody mechanism of action: BsAbs bind two different types of antigen. 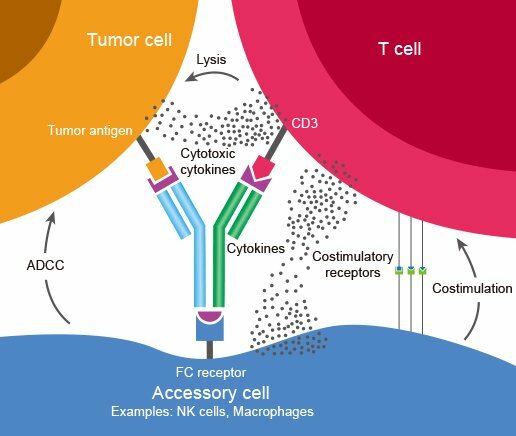 In this image a BsAb is shown, its one arm binding tumor antigen and the other binding CD3 determinant on surface of a T cell. This cross-linking of tumor and effector cells increases their proximity while simultaneously triggering T cell activation. The result is a targeted and highly effective tumor cell killing. Bispecific antibodies are different from normal monoclonal antibodies given the fact that they have dual functionalities. And so BsAbs are in theory superior to conventional mAbs because they offer the benefit of combining two drugs in one molecule. Clinical development of BsAb is currently focusing on cancer therapy and inflammatory diseases. The goal of these efforts is to simultaneously target various multiple targets involved in disease pathways and thereby increase therapeutic efficacy. Broadly speaking, BsAbs are divided into two classes – those bearing an Fc region and those without an Fc region. The advent of recombinant DNA methodologies has resulted in a range of recombinant BsAbs with over 50 different formats now being produced. See examples of few formats in the schematic below. 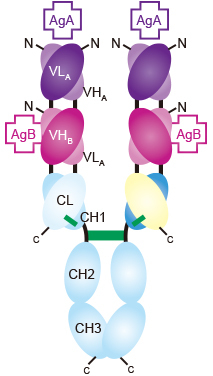 Figure 2: First bispecific antibodies were developed by chemical cross-linking of monoclonal antibodies (mAbs) or of Fab fragments, or by quadroma technology. 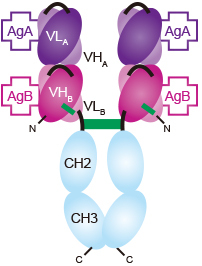 Recombinant antibody engineering has allowed for the creation of recombinant bispecific antibody fragments comprising the variable heavy (VH) and light (VL) domains of the parental mabs. 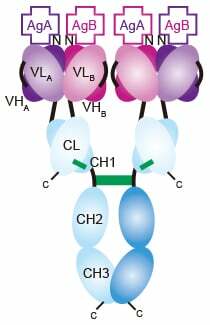 Few examples include scFv (single-chain variable fragment), BsDb (bispecific diabody), scBsDb (single-chain bispecific diabody), scBsTaFv (single-chain bispecific tandem variable domain), DNL-(Fab)3 (dock-and-lock trivalent Fab), sdAb (single-domain antibody), BssdAb (bispecific single-domain antibody). BsAbs with an Fc region are useful for carrying out Fc mediated effector functions such as ADCC and CDC. They have the half-life of normal IgG. On the other hand BsAbs without the Fc region (bispecific fragments) rely solely on their antigen-binding capacity for carrying out therapeutic activity. Due to their smaller size these fragments have better solid-tumor penetration rates but they are also rapidly cleared from circulation leading to shorter in vivo half-lives. One advantage of BsAb fragments is that since they do not require glycosylation they can be easily produced in bacterial cells. Now scientists can adjust the size, valency, flexibility and half-life of BsAbs to suit the application. 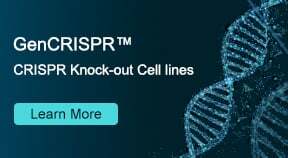 GenScript Production Scientists have the experience in producing a variety of IgG formats including Bispecific IgG. To learn more about GenScript antibody production services, visit GenScript recombinant antibody service selection guide page and choose from services that suit your application. Using recombinant DNA technology, Bispecific IgG antibodies can be assembled from two different heavy and light chains expressed in the same cell line. But because of random assembly of the different chains, large proportions of nonfunctional molecules and undesirable HC homodimers are generated. To address this problem, scientists often fuse a second binding moiety (e.g., single chain variable fragment) to the N or C terminus of the H or L chain resulting in tetravalent BsAbs containing two binding sites for each antigen. Few other methods to address the LC-HC mispairing and HC homodimerization are listed in the table below. 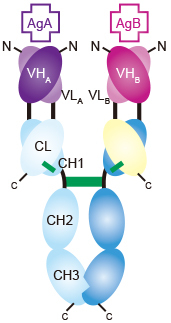 The generation of bivalent, BsAbs was made easier by the development of the “knobs-into-holes” technology where the H chain heterodimerization was forced by introducing different mutations into the two CH3 domains resulting in asymmetric antibodies. Specifically a “knob” mutation is made into one HC and a “hole” mutation is created in the other HC to promote heterodimerization. In this the direct addition of a new antigen-binding moiety to full length IgG results in fusion proteins with tetravalency. Examples include IgG C-terminal scFv fusion and IgG N-terminal scFv fusion. This involves replacing the Fab fragment of an IgG with a bispecific diabody (derivative of the scFv). In this the VL and VH domains of IgG with one specificity were fused respectively to the N-terminal of VL and VH of an IgG of different specificity via a linker sequence to form a DVD-IgG. GenScript production team scientists can produce a variety of antibody formats including IgG, IgA, IgM, Bispecific IgG, scFv, BiScFv and Fc fusion proteins. GenScript scientists perform a variety of optimization experiments and leverage years of collective experience to achieve high yields and deliver high quality antibodies to clients. A generic IgG1 production scheme is listed below. In order to protect client and project information, experimental details and optimization parameters have been withheld. IgG Antibody Gene Synthesis and Subcloning: After customer's approval, target DNA sequences are designed and synthesized. The complete sequences are subcloned into a proprietary vector for expression. IgG Antibody Cell Culture and Transient Transfection: Cells are grown in serum-free media. Recombinant plasmids encoding H and L chains are transiently co-transfected to suspension cell cultures. Cell culture supernatant is collected on day-5, post-transfection for SDS-PAGE analysis, in order to evaluate expression levels. IgG Antibody Purification and Analysis: Purification is carried out using protein A column. Eluted fractions are analyzed by SDS-PAGE and Western blot and pooled and buffer exchanged to the final storage buffer. Deliverables: Synthetic genes in pUC57 vector, optimized gene sequence report and purified antibody at listed amount and purity were delivered to the client along with QC data and comprehensive report. 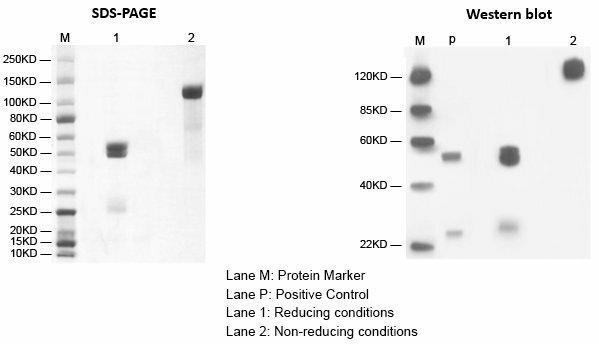 Purified Bispecific IgG Antibody SDS-PAGE (left) and Western Blot of the same panel (right) under reducing and non-reducing conditions. Antibody Discovery: GenScript has over 10 years of experience in therapeutic antibody development, offering a variety of services in the early therapeutic antibody discovery phase. For example, GenScript's Antibody Engineering group can build antibody library with up to 1010 individual clones, to speed up your antibody discovery efforts. Antibody Sequencing: GenScript's advanced Antibody Sequencing technology offers fast and professional sequencing services for your monoclonal antibodies. Assays: GenScript has developed several cell-based ADCC/CDC functional assays to profile the efficacy and potency of your therapeutic antibodies using proprietary recombinant effector cells. Antibody Engineering: GenScript scientists' extensive experience in antibody engineering can provide superior services such as antibody humanization, affinity maturation and more. 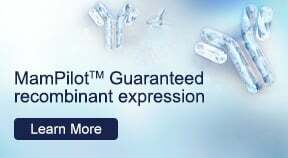 Antibody Production: With solid expertise in recombinant antibody (rAb) production techniques, GenScript provides a comprehensive rAb service portfolio that deliver microgram to gram quantities of pure rAb for each stage of your Ab drug discovery program. 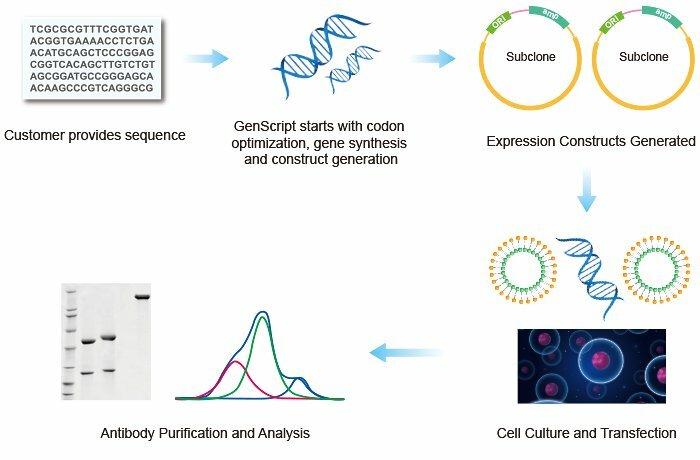 PK/PD Study: GenScript offers over 120 tumor and inflammation models for evaluation of in vivo efficacy, PK/PD, biomarker and bioanalysis studies. 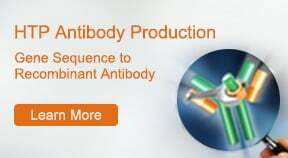 GenScript Anti-idiotype Antibody services are also a powerful tool for antibody drug PK/PD and immunogenicity studies. Antibody services are also a powerful tool for antibody drug PK/PD and immunogenicity studies. You can also view our Recombinant Antibody Service Selection Guide to identify services that are the best match for your application.